Weather is still good this Valentine’s weekend, but our typical fare of slot canyons would be a brutal ice fest, and even the popular trails are icy. But the summits are clean and in the sun, and the daytime temps are pleasant, so long slickrock rambles become not only possible, but ideal in February. Ryan hears how much fun we’re having so drives down the previous evening to join; this is helpful; instead of Jared waiting for me all the time, he can wait for his best friend as well. The area of Zion NP south of the tunnel and east of the highway is largely unknown, untravelled, and un-all sorts of things. It’s summits see fewer visits than some peaks in the Andes or Himalayas. We park at the tunnel entrance, and start jogging up Gifford Canyon. The trickle of water is frozen into a white ribbon of ice, the ripples in the wet sand are frozen so footprints leave no mark, and the seaps have grown into bulbous currents of frozen water. 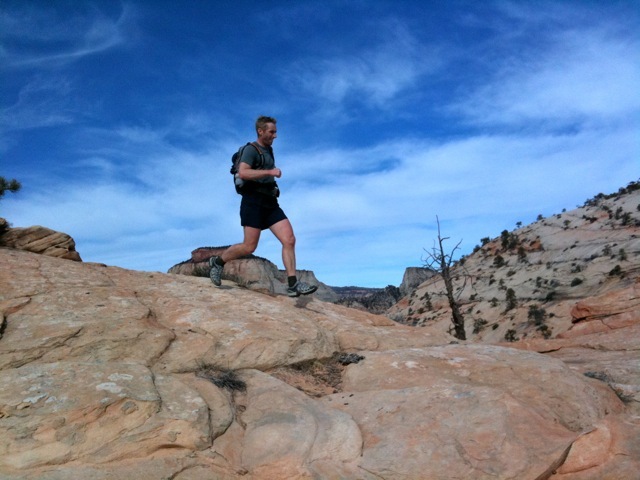 Then we’re onto the slickrock, hit the sun, and we’re in shorts and t-shirts the rest of the day. 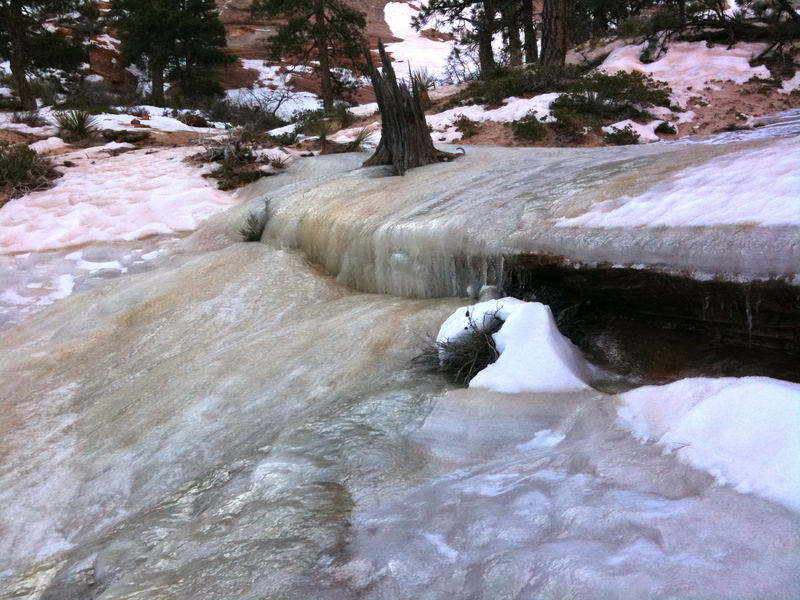 Winter in Zion is great! Our plan is to get up on the ridge above, climb “Destination Peak” at one end, then march down the ridge bagging each summit along the way, then traverse above the canyon to the opposite ridge and tag all those summits as well. So that’s mostly what we did. An entirely unique aspect to zioneering is the existence of an ability threshold. You must be comfortable scrambling 4th and low 5th class sandstone, using friction technique, with virtually no holds, occasionally on unstable choss, and with no protection. If you can do that, you can climb anything; if you can’t, you’re stuck on the Emerald Pools trail. You’re either in or you’re out; there is no in-between. This is especially true in this SE quadrant, where the higher starting elevation means no shin-shredding approaches, and the lack of deep drainages means fewer vertical barricades of unclimbable faces. In places one can literally step out of the car and onto clean slickrock, and stay on it all day. We were free to ramble! “You gotta want it Ryan!” Jared would call out. This as we were jogging merrily along beautiful slickrock formations, the sun shining and 66d temperatures. The beauty of setting an OKT of course, is that it is impossible for anyone to ever best it. At any rate, from the top of Jenny the rest of the proposed route looked too easy; it was only Noon, and “Lost Peak” to the East looked really good, so we hung a right and headed over there. The basin in between had beautiful formations reminiscent of The Wave, and Lost Peak itself was clean and excellent. So we decided to keep going, toward “The Triplets”, the next summits to the East. They turned out to be problematic; the rock quality changed – one can’t tell by looking from afar – they were total choss piles. “Slabalanche!” someone would call out, as the stack of ‘dinner plate’ rocks, each one weighing 200 lbs, precariously clinging to 40 degree angle smooth slickrock, with a layer of sand in between, would teeter and make noise and threaten to sweep themselves and those who stood on them into the oblivion below. How to avoid slabalanches should be taught at mountaineering schools I think. Unfortunately, beacons and probes would be no help to those caught in one. We executed the “pine needle traverse”, probably the crux pitch of the whole route, consisting of controlled steps and slides across a smooth slab covered with slippery pine needles directly over a 1,000′ drop, using small prickly drought-stricken bushes as handholds. In normal climbing, vegetation is to be avoided, but in zioneering, the bush hold is key, its the best, and one quickly learns the proper techniques for making them work (don’t pull up, pull straight without bending, grab close to it’s base, it’s OK if your forearm is cut and bleeding after). It was time to call it a day after the Triplets. Ryan and Jared had to drive back to SLC that evening, and a hot shower was in order first. 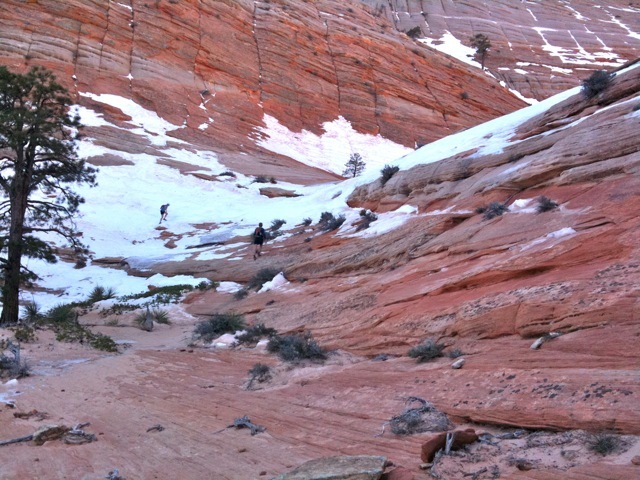 We skidded down some dirt, slid down some snow, avoided the clear water ice in the drainage, and ran down the slickrock bands back to the road. Jared’s photo’s here. Jared’s excellent map of the route here. 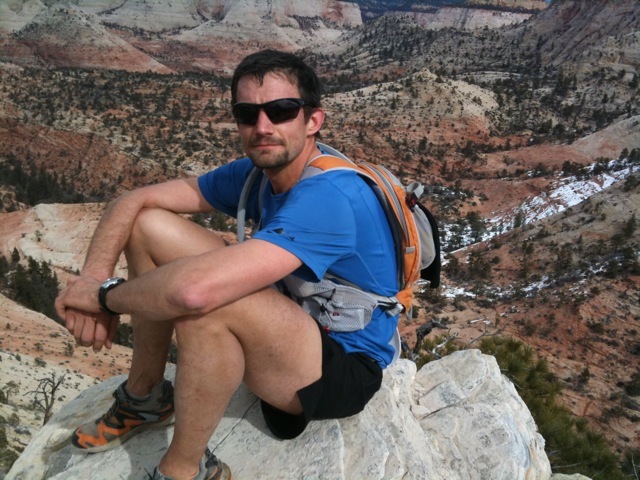 This entry was posted on February 15, 2011 at 11:59 pm and is filed under Trip Report. You can follow any responses to this entry through the RSS 2.0 feed. You can leave a response, or trackback from your own site. OKT 🙂 Wonder who has the most of those? Always enjoy reading about your adventures. Happy for you that you’re back at it. Great write-up and thank you again for a stellar weekend. I live for adventures like this and we packed 2 great ones into this past weekend. Perfect weather, fabulous friends, a great route, what more could we possibly ask for? Well, the one thing missing was my wife… But at least I knew that she too was out enjoying the second-most perfect weekend in Zion. This looks so stellar.. some year I will join. You should sled that stuff, Jared! What are the dark colored rocks sitting on the slab? meteorites? I hear the sledding was epic; sorry I missed it. 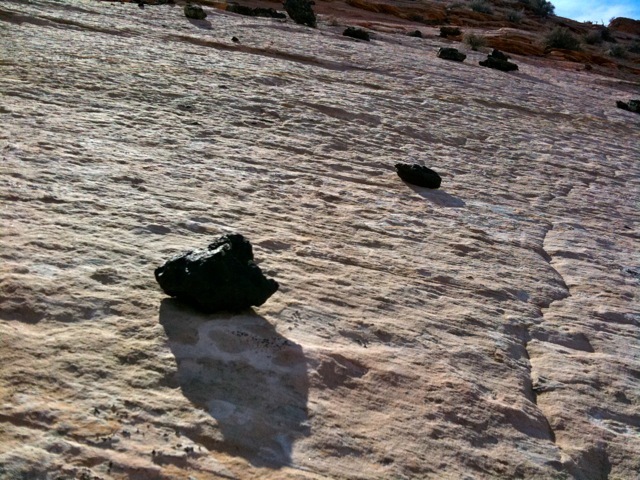 Dark rocks are basaltic erratics (that is the term). Would definitely like to have you in!